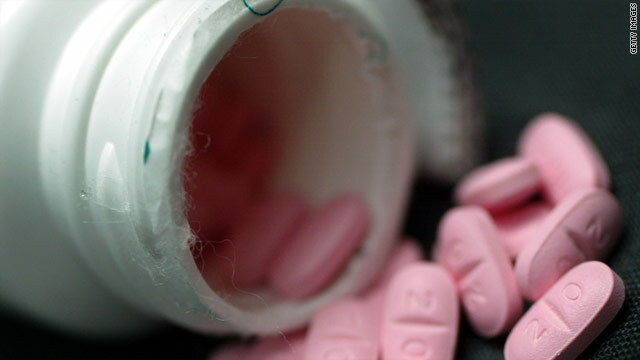 Paxil, shown here, and an older drug called Tofranil were the two antidepressants used in the study. (Health.com) -- For people with milder cases of depression, fake pills may be just as effective as antidepressant drugs, a new study suggests. The study confirmed that antidepressants are substantially better than fake pills, or placebo, in people with severe depression, but the researchers found "little evidence" that the drugs are more effective than placebo in people with milder depressive symptoms. The findings don't mean that antidepressants don't work -- only that most of the drugs' effectiveness in people with milder depression can be attributed to the placebo effect. The implications of the study for the everyday treatment of depression may be limited, however, because the researchers looked at just two antidepressants, paroxetine (Paxil) and imipramine (Tofranil), an older antidepressant known as a tricyclic. Newer and more potent antidepressants might have produced a different result, says Dr. David Hellerstein, a research psychiatrist at the New York State Psychiatric Institute in New York City who specializes in treating chronic, low-grade depression. People on antidepressants should not stop taking them based on these new findings, Hellerstein adds. "Don't do anything rash, and talk to your doctor if you think this is relevant to you," he says. The study, a new analysis of data from previously conducted clinical trials, was led by Jay Fournier at the University of Pennsylvania and was published in the Jan. 5 issue of the Journal of the American Medical Association. Health.com: Is it clinical depression or just the blues? Fournier and his colleagues looked at 2,164 clinical trials of antidepressants in all, but they ultimately excluded all but six from their analysis for a variety of reasons -- because they weren't placebo-controlled or were shorter than six weeks long, for instance. The researchers found that, on average, the benefits of antidepressants over placebo were "minimal or nonexistent" in people whose depression was less than "very severe" according to American Psychiatric Association guidelines. Even people with "severe" depression"-- which is one step below "very severe" --did not experience a significant effect from antidepressants compared to placebo, the study reports. "It's a very well done paper in a top journal, and they're raising a serious question," says Hellerstein. But, he says, the findings aren't comprehensive enough to indicate whether doctors should continue to prescribe antidepressants to people with mild or moderate depressive symptoms. Health.com: Should you take antidepressants? The drugs included in the study are rarely used as first-line treatments today, Hellerstein says, and two of the imipramine studies included in the analysis used a low dose. In addition, he says, the longest study Fournier and his team included lasted 11 weeks; some drugs take longer than that to produce their full effect, whereas the placebo effect is strongest in the first few weeks of treatment. Both Hellerstein and Fournier also point out that the patients in the placebo arm of the studies received attention and care in addition to a fake pill. They were assessed regularly, talked about their symptoms with a professional, and received physical and psychiatric exams -- all of which could have been therapeutic for people who may have been isolated, suffering in silence, or dragging themselves to work every day. "It seems like that, in and of itself, provided some benefit for people," Fournier says. Fournier agrees with Hellerstein that the findings are not conclusive regarding the treatment for mild to moderate depression. "In terms of moving forward, it's hard to say what the treatment should be," he says. For his part, Hellerstein says that, although it's too early to conclude that antidepressants won't help a person whose symptoms fall below a certain threshold of severity, the new findings do suggest that psychotherapy may be more appropriate than antidepressants for people with mild depression that hasn't lasted a long time. "It's a valid question that a patient should bring to their doctor's office," he says. In 2005, the most recent year for which statistics are available, 170 million prescriptions for antidepressants were filled in the United States, according to the U.S. Department of Health & Human Services. Previous studies have reported that antidepressants are more likely to outperform placebo in patients who are more depressed when they begin treatment. But as Fournier and his colleagues note, these analyses examined only patients with "severe" depression or worse. The published data on the efficacy of antidepressants in people with mild to moderate depression is limited -- partly by design, according to the study. Because people with mild to moderate depression tend to respond more readily to placebo, many antidepressant trials exclude these patients in order to minimize the placebo response rate, the study says. Moreover, Fournier and his colleagues write, in some antidepressant trials prospective participants are given a placebo for several days or more before the trial officially begins. If they improve substantially on the placebo during this "washout period," they are excluded from the trial. Excluding people who have shown that they respond to placebo, the authors explain, may disguise the true extent of the placebo effect in the published study.